It is often said that not everything which glitters is gold and similarly not everything which may appear substandard is. One may, nevertheless, reply to these adages, to each his own. This was clearly the case with Leonard Hinds. 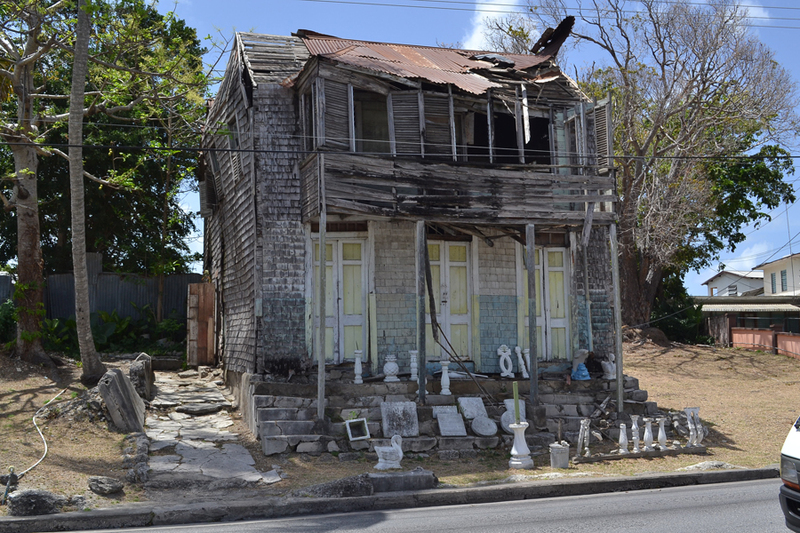 The 75-year-old lives along Bank Hall Main Road in St. Michael. A person unfamiliar with the area would find it hard to believe that one “particularly outstanding” building is home to three people. Leaning to the west, the dilapidated structure looked almost as if it was about to cave in. Built with a “hip roof” sometime in the early 20th century, many of the shingles which once beautified even the sides of the residence have long parted ways with the frame and have fallen to the ground, while others look set to follow suit. There is no electricity running throughout the three-bedroom house, neither is there running water. In addition, the collapsed roof, from which Hinds is often seen feeding birds, show the only signs of an attempt at recent renovations. In spite of all of this, Hinds who invited Barbados TODAY into his home for an interview, described his conditions as “good” — and his girlfriend, Mirleen Cheltenham, who has lived at the residence for close to 12 years agreed. When asked if she wasn’t afraid the floor would fall in or that a high wind would cause the whole building to collapse, she replied she slept downstairs so she had no reason to be afraid. “I don’t need no assistance,†I’m all right. I had my breakfast this morning and I’m good,” Hinds repeated with a smile. The former prison officer for 27 years, who originally lived in third Avenue Station Hill, St. Michael, moved to the house to care for a family friend who owned the property. That was 25 years ago and back then, he would ask her to repair the house but, he recalled how his now deceased friend would say: “This is my so and so house. My this and that give me this and I ain’t want no house fix.” She died and left the house in its current state, but he had arrived at the conclusion that he could not continue to leave it how it was. This was why he decided to get assistance. Though reiterating he was “good” with how he was living, he added that after an interview with the Urban Development Commission they decided that to demolish the structure and rebuild a “proper” house for him was the best option. The UDC, he explained, was now waiting for them to clear all their contents from the house to get the process started. “Up to this morning I was making arrangements to have a shed built to the side of the house to put all my stuff in but what is my set back is I have items keeping for a daughter of mine. She didn’t come for them but I can’t put them out. “I can get somewhere tomorrow but I have to get some place to entertain them… I could have gone every since but them [UDC] want to take me down St. Lucy ’til it finish build but I tell them straight I would let this drop down on me first ’cause I don’t want to live in St. Andrew, St. Lucy or St. Philip.